Surat Thani is one of those Thai cities that you have probably heard of because it’s a very popular transport hub for southern Thailand. Serving as the main gateway to the islands of Koh Samui, Koh Tao and Koh Phangan, Surat Thani sees thousands of tourists flock through it each and every year, but only a very small proportion of these tourists will end up spending any considerable amount of time within the city itself. However, if the call of the beach can wait a little while, you may like to spend some time in a more atypical Thai city where you can get to experience the culture of this country without a huge Western influence, wander around its pretty temples and shrines, and taste some amazing street food. If you’re looking for information on some of the ways you can travel from Bangkok to Surat Thani, read on for all of the options. If you’re pushed for time, catching a flight to Surat Thani from Bangkok is definitely the best way to travel. It’s roughly 650 kilometers (406 miles) from the Thai capital so traveling by road is a lengthy journey whereas a flight takes just over an hour. Even when you add in the time to get to the airport, check-in and collect your baggage afterwards, flights between these two cities are still by far the fastest way to travel, but, of course, they are more expensive than buses or trains. You can minimize the cost as much as possible by booking your flight to Surat Thani as far in advance as you can. Leaving your purchase until a day or so before you are due to travel will mean you end up paying far more. Also, don’t just restrict your flight search to one airline; there are several other options to consider too. 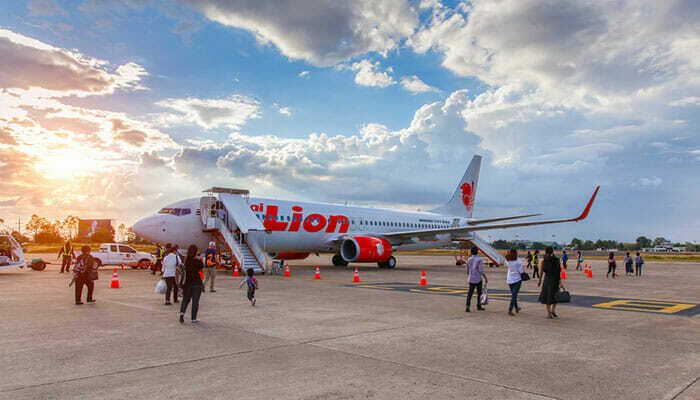 Only Thai Airways (operated by Thai Smile) flies from Bangkok’s Suvarnabhumi Airport, but if you can travel from Don Mueang Airport instead, you can choose from Thai Lion Air, Thai AirAsia, and Nok Air. Between these airlines there are usually over a dozen flights per day. Once you arrive at Surat Thani International Airport, you will be approximately 21 kilometers (13 miles) west of the city center. There will be buses and tuk-tuks available to take you into the city for a reasonable price. Hua Lamphong Train Station in Bangkok. Easy to reach with MRT (subway). © Sittirak Jadlit / Shutterstock, Inc. 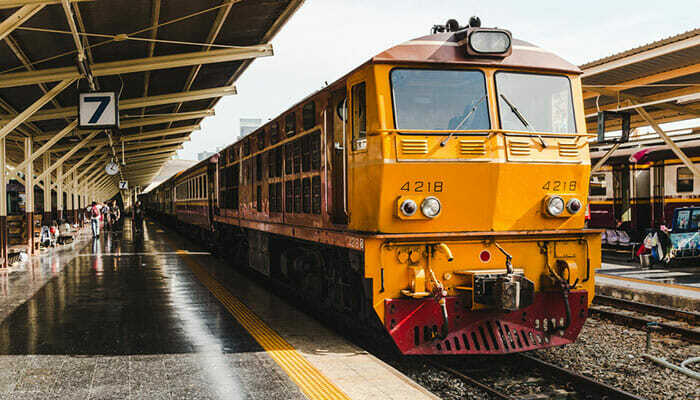 Taking the train in Thailand is a great option if you’re watching what you spend and would like to travel comfortably, but you’re not in a hurry. This is because the railway service in Thailand is very slow, with journeys often taking as long, and sometimes longer than, they take by road. Putting this aside though, daytime trains give you the chance to see some great scenery as you travel, and because you can get up and walk around, and make use of facilities, trains are arguably more comfortable than a bus or minivan. Trains from Bangkok depart from Hua Lamphong Station and there are multiple trains making the trip throughout the day. Depending on which train you catch, journey times range between 8 hours 40 minutes to as much as 12 hours 15 minutes, so this trip from Bangkok to Surat Thani will take you the entire day. Because it takes so long by train, the night trains with their sleeper service are a popular choice. You won’t see so much of the scenery as you travel, but you can sleep on the train and make the most of the time rather than wasting an entire day of traveling. Sleeper cabins are available in both 1st and 2nd class with both classes offering a good level of comfort. Once you arrive at Surat Thani Train Station you won’t actually be in the heart of the city but in a town called Phun Phin, which is about 15 kilometers (9 miles) west of Surat Thani. You’ll find plenty of buses and taxis available to take you to the city though. 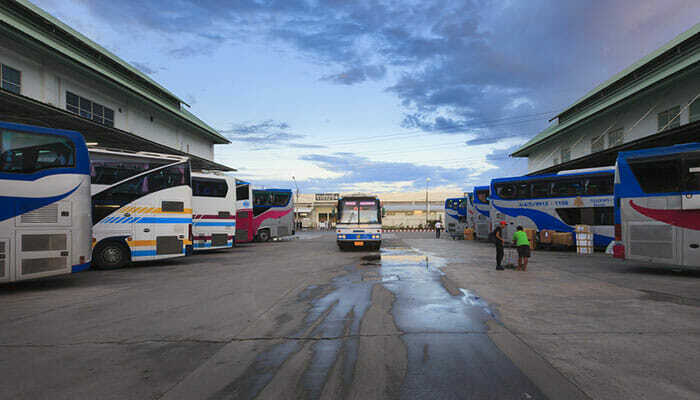 Bangkok Southern Bus Terminal © Gos Eye View / Shutterstock, Inc. The third option for traveling from Bangkok to Surat Thani is by bus. For budget travelers, buses are the most popular choice because they are so affordable, and, as mentioned above, they are no slower than the train – in fact, most buses will be faster than the train, taking somewhere between 9 and 11 hours to make the trip. Travel by bus from Bangkok to Surat Thani and you also have a good choice of operators and timetables. In terms of price, most of the operators are very comparable in what they charge but there will be a slight difference between “express” and “VIP” services with the VIP services giving a better level of comfort and usually including a meal and some refreshments onboard. Buses depart from Bangkok’s Southern Bus Terminal but be sure to check the times as there are only a few buses leaving in the morning. There’s then a large gap until later in the afternoon when the buses are more frequent. 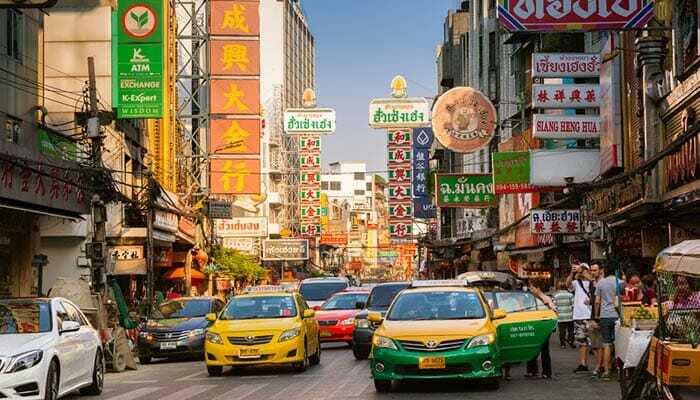 Taxis in Chinatown Bangkok © Elena Ermakova / Shutterstock, Inc.
A final option that’s perfect for travelers who are not on a budget and want the ultimate convenience, is to take a taxi or private minivan from Bangkok to Surat Thani. These can be booked through your hotel and tour operators usually require booking at least two days in advance. They do cost a lot of money – this is the most expensive way to travel – but you cannot beat them for convenience as they will pick you up from your hotel in Bangkok and take you directly to your hotel (or wherever you want to go) within Surat Thani. So, in order of cost, the most expensive way to get from Bangkok to Surat Thani is by taxi, then by plane, then by train, and finally, the cheapest is by bus.